For as long as basketball has been played, it’s been played with five positions. But through topological data visualization, Muthu Alagappan discovered the 10 positions hidden among them, with the power to help even the Charlotte Bobcats improve their lineup and win more games. Jeff Beckham is a contributor to Wired's sports blog, Playbook, where we wrote about Alagappan's award-winning work. Alagappan is a basketball fan who works at Ayasdi, a data visualization company in Palo Alto founded by Stanford mathematicians. Ayasdi specializes in visualizing the shape of data, transforming huge amounts of information into beautiful interactive networks that instantly uncover hidden patterns, like which genetic markers best indicate a likelihood of ovarian cancer. 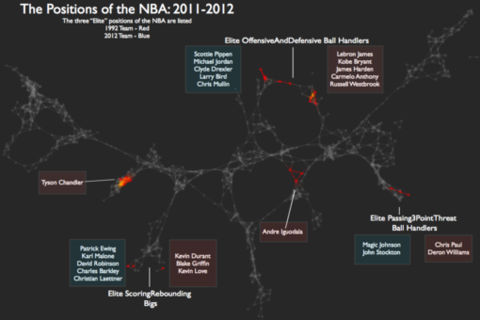 It's called topological data analysis, and it can be applied to sports, too. Come hear how Alagappan did it and what else he's uncovered in the data since his first discoveries. I'm a contributor to Playbook, Wired's sports blog. I'm also the communications manager for AT&T's Consumer Digital Experience division, working to tell the digital team's story to anyone who will listen. I'm a consultant at Ayasdi, a data visualization startup in Palo Alto that creates amazing software to find insights in big data. I've been a lifelong basketball fan, and in the past 18 months, I have researched, spoken about, and consulted NBA teams on basketball data analysis using Ayasdi's computational engine. I am also a first-year medical student at Stanford University, where I am interested in exploring the intersection between medicine and technology.